In early June of last year, some of the Bay Area’s best cannabis was on display – and in competition – at the Northern California High Times Cannabis Cup. I picked up a pass for Sunday and, like a kid in a candy shop, skipped from booth to booth checking out strains, sampling flavors, talking to really knowledgable people… pretty much living my best life. My first stop of the day was the Fig Farms booth so I could thank them for creating and sharing one my new favorite strains since moving to San Francisco: Purple Fig. I stuck around to check out all their strains on display and was immediately drawn to the unique smell of their Banana Fig #8 – not to mention, the nugs looked perfectly cured and were absolutely caked in trichomes. Even though I had just arrived and wanted to make a round of all the booths before making any decisions, I couldn’t tear myself away from the Banana Fig and ended up walking away with an 1/8th. 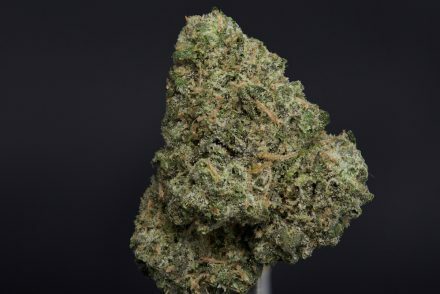 Fast forward to later that day, and Banana Fig #8 is named the best Indica at the Cannabis Cup (big props to Fig Farms). I meant to write a strain review after the Cup but one thing led to another and I smoked all of the Banana Fig before I had a chance to write down my thoughts on it. I finally crossed paths with Banana Fig once again, this time at Elevated San Francisco, and I’m not wasting a chance to give it a proper review. You can see the immense energy, passion and care put into every batch of flower from Fig Farms. This Banana Fig is no exception. The beautiful nuggets are meticulously manicured and expertly cured, a nice departure from much of the weed you see on shelves today. The smell translates really well into the subtle flavor of the Banana Fig. I say “subtle flavor” because the Banana Fig isn’t an overpowering, mouth-coating flavor, but instead it draws you in with soft flavors of banana + floral + creamy sweetness. It’s not like an OG that kicks you in the face with pinesol funk, but more like a seductress that lures you in slowly until you realize you’re in too deep and can’t escape from the terps. Banana Fig is a Cannabis Cup winner for a couple simple reasons: the nugs are beautiful with bag appeal for days, and the smells and flavors are unique and memorable. This is one from Fig Farms that you need to try (in addition to all their other top shelf flavors). Headstash Highlights (July 2018): Wedding Cake, Zkittles, and more!